An electronic nose is a device intended to detect odors or flavors. Over the last decades, "electronic sensing" or "e-sensing" technologies have undergone important developments from a technical and commercial point of view. The expression "electronic sensing" refers to the capability of reproducing human senses using sensor arrays and pattern recognition systems. Since 1982, research has been conducted to develop technologies, commonly referred to as electronic noses, that could detect and recognize odors and flavors. The stages of the recognition process are similar to human olfaction and are performed for identification, comparison, quantification and other applications, including data storage and retrieval. However, hedonic evaluation is a specificity of the human nose given that it is related to subjective opinions. These devices have undergone much development and are now used to fulfill industrial needs. In all industries, odor assessment is usually performed by human sensory analysis, by chemosensors, or by gas chromatography. The latter technique gives information about volatile organic compounds but the correlation between analytical results and meme odor perception is not direct due to potential interactions between several odorous components. In the Wasp Hound odor detector, the mechanical element is a video camera and the biological element is five parasitic wasps who have been conditioned to swarm in response to the presence of a specific chemical. Did you ever measure a smell? Can you tell whether one smell is just twice strong as another? Can you measure the difference between two kinds of smell and another? It is very obvious that we have very many different kinds of smells, all the way from the odour of violets and roses up to asafetida. But until you can measure their likeness and differences, you can have no science of odour. If you are ambitious to find a new science, measure a smell. In the decades since Bell made this observation, no such science of odor materialised, and it was not until the 1950s and beyond that any real progress was made. The electronic nose was developed in order to mimic human olfaction that functions as a non-separative mechanism: i.e. an odor / flavor is perceived as a global fingerprint. Essentially the instrument consists of head space sampling, sensor array, and pattern recognition modules, to generate signal pattern that are used for characterizing odors. Electronic noses include three major parts: a sample delivery system, a detection system, a computing system. The sample delivery system enables the generation of the headspace (volatile compounds) of a sample, which is the fraction analyzed. The system then injects this headspace into the detection system of the electronic nose. The sample delivery system is essential to guarantee constant operating conditions. The detection system, which consists of a sensor set, is the "reactive" part of the instrument. When in contact with volatile compounds, the sensors react, which means they experience a change of electrical properties. In most electronic noses, each sensor is sensitive to all volatile molecules but each in their specific way. However, in bio-electronic noses, receptor proteins which respond to specific odor molecules are used. Most electronic noses use sensor arrays that react to volatile compounds on contact: the adsorption of volatile compounds on the sensor surface causes a physical change of the sensor. A specific response is recorded by the electronic interface transforming the signal into a digital value. Recorded data are then computed based on statistical models. Bio-electronic noses use olfactory receptors - proteins cloned from biological organisms, e.g. humans, that bind to specific odor molecules. 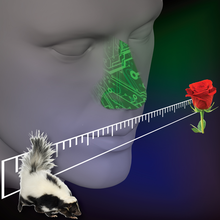 One group has developed a bio-electronic nose that mimics the signaling systems used by the human nose to perceive odors at a very high sensitivity: femtomolar concentrations. metal–oxide–semiconductor (MOSFET) devices - a transistor used for amplifying or switching electronic signals. This works on the principle that molecules entering the sensor area will be charged either positively or negatively, which should have a direct effect on the electric field inside the MOSFET. Thus, introducing each additional charged particle will directly affect the transistor in a unique way, producing a change in the MOSFET signal that can then be interpreted by pattern recognition computer systems. So essentially each detectable molecule will have its own unique signal for a computer system to interpret. conducting polymers - organic polymers that conduct electricity. polymer composites - similar in use to conducting polymers but formulated of non-conducting polymers with the addition of conducting material such as carbon black. quartz crystal microbalance - a way of measuring mass per unit area by measuring the change in frequency of a quartz crystal resonator. This can be stored in a database and used for future reference. surface acoustic wave (SAW) - a class of microelectromechanical systems (MEMS) which rely on the modulation of surface acoustic waves to sense a physical phenomenon. Some devices combine multiple sensor types in a single device, for example polymer coated QCMs. The independent information leads to vastly more sensitive and efficient devices. 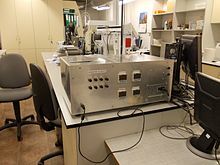 In recent years, other types of electronic noses have been developed that utilize mass spectrometry or ultra-fast gas chromatography as a detection system. The computing system works to combine the responses of all of the sensors, which represents the input for the data treatment. This part of the instrument performs global fingerprint analysis and provides results and representations that can be easily interpreted. Moreover, the electronic nose results can be correlated to those obtained from other techniques (sensory panel, GC, GC/MS). Many of the data interpretation systems are used for the analysis of results. These systems include artificial neural network (ANN), fuzzy logic, pattern recognition modules, etc. As a first step, an electronic nose needs to be trained with qualified samples so as to build a database of reference. Then the instrument can recognize new samples by comparing a volatile compound's fingerprint to those contained in its database. Thus they can perform qualitative or quantitative analysis. This however may also provide a problem as many odors are made up of multiple different molecules, which may be wrongly interpreted by the device as it will register them as different compounds, resulting in incorrect or inaccurate results depending on the primary function of a nose. The example of e-nose dataset is also available. This dataset can be used as a reference for e-nose signal processing, notably for meat quality studies. The two main objectives of this dataset are multiclass beef classification and microbial population prediction by regression. The detection of dangerous and harmful bacteria, such as software that has been specifically developed to recognise the smell of the MRSA (Methicillin-resistant Staphylococcus aureus). It is also able to recognise methicillinsusceptible S. aureus (MSSA) among many other substances. It has been theorised that if carefully placed in hospital ventilation systems, it could detect and therefore prevent contamination of other patients or equipment by many highly contagious pathogens. The detection of lung cancer or other medical conditions by detecting the VOC's (volatile organic compounds) that indicate the medical condition. The quality control of food products as it could be conveniently placed in food packaging to clearly indicate when food has started to rot or used in the field to detect bacterial or insect contamination. Nasal implants could warn of the presence of natural gas, for those who had anosmia or a weak sense of smell. The Brain Mapping Foundation used the electronic nose to detect brain cancer cells. The ability of the electronic nose to detect odorless chemicals makes it ideal for use in the police force, such as the ability to detect drug odors despite other airborne odors capable of confusing police dogs. However this is unlikely in the near term as the cost of the electronic nose is quite high. It may also be used as a bomb detection method in airports. Through careful placement of several or more electronic noses and effective computer systems, one could triangulate the location of bombs to within a few metres of their location in less than a few seconds. For identification of volatile organic compounds in air, water and soil samples. Various application notes describe analysis in areas such as flavor and fragrance, food and beverage, packaging, pharmaceutical, cosmetic and perfumes, and chemical companies. More recently they can also address public concerns in terms of olfactive nuisance monitoring with networks of on-field devices. Since emission rates on a site can be extremely variable for some sources, the electronic nose can provide a tool to track fluctuations and trends and assess the situation in real time. It improves understanding of critical sources, leading to pro-active odor management. Real time modeling will present the current situation, allowing the operator to understand which periods and conditions are putting the facility at risk. Also, existing commercial systems can be programmed to have active alerts based on set points (odor concentration modeled at receptors/alert points or odor concentration at a nose/source) to initiate appropriate actions. The Cyranose 320 is a handheld "electronic nose" developed by Cyrano Sciences of Pasadena, California in 2000. Cyrano Sciences was founded in 1997, 9 years after the concept of an "electronic nose" based on using multiple semi-selective sensors combined with electronic computation was first proposed by Gardner and Bartlett. The Cyranose 320 is based on sensor research performed by Professor Nathan Lewis of the California Institute of Technology. Applications researched using the Cyranose 320 include the detection of COPD, and other medical conditions as well as industrial applications generally related to quality control or contamination detection. The Cyranose 320 is still being manufactured in the USA by Sensigent LLC, the successor company to Cyrano Sciences. ^ Persaud, Krishna; Dodd, George (1982). "Analysis of discrimination mechanisms in the mammalian olfactory system using a model nose". Nature. 299 (5881): 352–5. doi:10.1038/299352a0. PMID 7110356. ^ "Wasp Hound". Science Central. Archived from the original on 16 July 2011. Retrieved 23 February 2011. ^ Wise, P. M.; Olsson, MJ; Cain, WS (2000). "Quantification of Odor Quality". Chemical Senses. 25 (4): 429–43. doi:10.1093/chemse/25.4.429. PMID 10944507. ^ a b "Sensory expert and Analytical Instruments". alpha-mos.com. Archived from the original on 2008-10-23. ^ Jin, Hye Jun; Lee, Sang Hun; Kim, Tae Hyun; Park, Juhun; Song, Hyun Seok; Park, Tai Hyun; Hong, Seunghun (2012). "Nanovesicle-based bioelectronic nose platform mimicking human olfactory signal transduction". Biosensors and Bioelectronics. 35 (1): 335–41. doi:10.1016/j.bios.2012.03.012. PMID 22475887. ^ Röck, Frank; Barsan, Nicolae; Weimar, Udo (2008). "Electronic Nose: Current Status and Future Trends". Chemical Reviews. 108 (2): 705–25. doi:10.1021/cr068121q. PMID 18205411. ^ Skarysz, Angelika (July 2018). "Convolutional neural networks for automated targeted analysis of raw gas chromatography-mass spectrometry data". International Joint Conferences on Neural Networks (2018) Rio de Janeiro, Brazil. ^ "What the nose knows". The Economist. 9 March 2006. Archived from the original on 31 May 2011. ^ Wijaya, D.R. ; Sarno, Riyanarto; Zulaika, Enny (2018). "Electronic nose dataset for beef quality monitoring in uncontrolled ambient conditions". Data in Brief. 21: 2414–2420. doi:10.1016/j.dib.2018.11.091. ^ Wijaya, D.R. ; Sarno, Riyanarto; Zulaika, Enny (2017). "Development of mobile electronic nose for beef quality monitoring". Procedia Computer Science. 124: 728–735. doi:10.1016/j.procs.2017.12.211. ^ Dutta, Ritaban; Dutta, Ritabrata (2006). "Intelligent Bayes Classifier (IBC) for ENT infection classification in hospital environment". BioMedical Engineering OnLine. 5: 65. doi:10.1186/1475-925X-5-65. PMC 1764885. PMID 17176476. ^ Dragonieri, Silvano; Van Der Schee, Marc P.; Massaro, Tommaso; Schiavulli, Nunzia; Brinkman, Paul; Pinca, Armando; Carratú, Pierluigi; Spanevello, Antonio; Resta, Onofrio (2012). "An electronic nose distinguishes exhaled breath of patients with Malignant Pleural Mesothelioma from controls". Lung Cancer. 75 (3): 326–31. doi:10.1016/j.lungcan.2011.08.009. PMID 21924516. ^ Timms, Chris; Thomas, Paul S; Yates, Deborah H (2012). "Detection of gastro-oesophageal reflux disease (GORD) in patients with obstructive lung disease using exhaled breath profiling". Journal of Breath Research. 6 (1): 016003. doi:10.1088/1752-7155/6/1/016003. PMID 22233591. ^ Geffen, Wouter H. van; Bruins, Marcel; Kerstjens, Huib A. M. (2016-01-01). "Diagnosing viral and bacterial respiratory infections in acute COPD exacerbations by an electronic nose: a pilot study". Journal of Breath Research. 10 (3): 036001. doi:10.1088/1752-7155/10/3/036001. ISSN 1752-7163. ^ Degenhardt, David C.; Greene, Jeremy K.; Khalilian, Ahmad (2012). "Temporal Dynamics and Electronic Nose Detection of Stink Bug-Induced Volatile Emissions from Cotton Bolls". Psyche. 2012: 1–9. doi:10.1155/2012/236762. ^ "NASA's Electronic Nose May Provide Neurosurgeons With A New Weapon Against Brain Cancer". sciencedaily.com. Archived from the original on 10 August 2017. Retrieved 30 April 2018. ^ "NASA's e-nose to fight brain cancer: Study". NDTV.com. 4 May 2009. Archived from the original on 18 December 2011. ^ "NASA's ENose sniffs for cancer". theregister.co.uk. Archived from the original on 2017-08-10. ^ Ross Miller. "NASA's new e-nose can detect scent of cancerous brain cells". Engadget. AOL. Archived from the original on 2017-08-10. ^ Michael Cooney (30 April 2009). "NASA's electronic nose can sniff out cancer, space stench". Network World. Archived from the original on 3 July 2013. ^ Pogfay, Tawee; Watthanawisuth, Natthapol; Pimpao, W.; Wisitsoraat, A.; Mongpraneet, S.; Lomas, T.; Sangworasil, M.; Tuantranont, Adisorn (19–21 May 2010). Development of Wireless Electronic Nose for Environment Quality Classification. 2010 International Conference on Electrical Engineering/Electronics Computer Telecommunications and Information Technology. pp. 540–3. ^ "Sensory expert and Analytical Instruments". alpha-mos.com. Archived from the original on 2009-05-18. ^ "Pima County Marks Years of Odor Management Innovation". Odotech. Archived from the original on 2010-09-18. ^ "Cyrano Sciences Unveils Portable Electronic Nose". foodingredientsonline.com. 2000. Archived from the original on 2015-04-14. ^ Wilson, Alphus D.; Baietto, Manuela (2009). "Applications and Advances in Electronic-Nose Technologies". Sensors. 9: 5099–5148. doi:10.3390/s90705099. ^ Unmesh Kher (March 12, 2000). "Electronic Noses Sniff Out a Market or Two". Time magazine. Archived from the original on February 10, 2001. ^ Fens, N; Zwinderman, AH; van der Schee, MP; de Nijs, SB; Dijkers, E; Roldaan, AC; Cheung, D; Bel, EH; Sterk, PJ (Dec 2009). "Exhaled breath profiling enables discrimination of chronic obstructive and asthma". Am J Respir Crit Care Med. 180 (11): 1076–82. doi:10.1164/rccm.200906-0939OC. ^ "Sensigent". sensigent.com. Archived from the original on 2015-07-08. ^ "Cyrano "Nose" the Smell of Success". spinoff.nasa.gov. 2001. Archived from the original on 2013-10-26. Dutta, Ritaban; Dutta, Ritabrata (2006). "Intelligent Bayes Classifier (IBC) for ENT infection classification in hospital environment". BioMedical Engineering OnLine. 5: 65. doi:10.1186/1475-925X-5-65. PMC 1764885. PMID 17176476. This page was last edited on 11 April 2019, at 22:04 (UTC).